CONTINUING A TRADITION OF EXCEPTIONAL CARE, CLOSE TO HOME. Welcome to the new Beaufort Memorial Keyserling Cancer Center, designed in partnership with MUSC Health and Alliance Oncology to meet the needs of our growing community by expanding and consolidating oncology services. Like its predecessor in Port Royal, the bright, spacious on-campus center makes inspired use of the healing arts in its design and furnishings and brings together under one roof a full array of cancer support services. Staffed by experienced, compassionate board-certified radiation and medical oncologists, the Keyserling Cancer Center features a state-of-the-art Varian TrueBeamTM linear accelerator for the delivery of radiation therapy. On-site cancer experts work with their counterparts at MUSC Health to develop an individualized, evidence-based treatment plan—and an optimal outcome—for every patient. The new Keyserling Cancer Center stands ready to serve our community for years to come. Purchases available online and at the door. Cindy Reid has been published in About Town, skirt!, Salon.com and The Coastal Mariner. A graduate of Mills College in Oakland, CA, she spent most of her career working with authors in the retail book business before becoming one herself. She has a daughter who lives in the state of Washington. A native of New York’s Hudson Valley, she now makes her home on St. Helena Island. Susan Deloach was born Susan Bessinger in Beaufort, where she still resides with her husband, Larry, and sons Hudson and Tucker. Susan has a gift for capturing the personality and unique essence of her subject whether on location or in the studio. Her portraits are as diverse as the personalities of the people she photographs some are edgy, some joyful, but all have one thing in common: the sensitive, skilled and thoughtful approach of the artist behind the camera. Emily Burgess received a Bachelor of Science in Journalism from Appalachian State University in Boone, NC. She is currently a stay-at-home mom to three boys and writes freelance. She moved to Beaufort in 2013 for her husband’s job and enjoys all the lowcountry has to offer. John Wollwerth is a photographer raised in New York, now living in Beaufort. He specializes in wedding and commercial photography, with additional background in portrait and stock photography. His work has appeared in such publications as The Washington Post, the Minneapolis Tribune, Coastal Living and South Carolina Homes and Gardens. John is involved with the Photography Club of Beaufort and the Professional Photographer of South Carolina. He lives with his wife and three children. Nathan Livesay is the Director of Economic Empowerment at World Orphans and Head Varsity Boys Basketball coach at Beaufort Academy. He has been a coach for the past 18 years and has written for various publications throughout the years. Carol Lauvray relocated from Ohio to Beaufort in 2011 to enjoy the pristine coastal beauty of the Lowcountry and this friendly, welcoming community. In Beaufort, Carol’s found more than a home--she’s found the ideal place to pursue her passions for history and writing. Carol has more than 20 years of experience in writing marketing communications and holds a Masters Degree in Organizational Communication from Ohio University. Her daughter Cristin and son-in-law Kevin live near Columbus, Ohio. Greyson Johnston is the Worship Pastor at Cross Community Church and Owner of GREYside Photography. Though he was not born in Beaufort, he has lived here long enough to be Beaufortonian (though he is more of a mountain guy than a beach guy). When he isn’t working he enjoys spending time with his wife, Lauryn, and his two boys, Everett and Walker. Bands, Brews & BBQ Itâ&#x20AC;&#x2122;s Time For Some Food, Music and Fun! 2015 Boundary Street Beaufort, SC 29902 (843) 379-8696 LETTERS TO THE EDITOR Write to us and tell us what you think. Beaufort Lifestyle welcomes all letters to the editor. Please send all letters via email to Naomi Forrestall at naomi@bridgemediapublishing. Letters to the editor must have a phone number and name of contact. Phone numbers will not be published. ARTICLE SUBMISSIONS Beaufort Lifestyle welcomes story ideas from our readers. If you have a story idea or photo essay you would like to share, please submit ideas and material by emailing Naomi Forrestall at naomi@bridgemediapublishing.com. Stories or ideas for stories must be submitted by email. Only feature stories and photo essays about people, places or things in Beaufort, Port Royal or the Sea Islands will be considered. 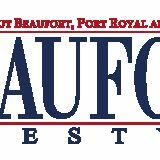 CIRCULATION: Beaufort Lifestyle is published monthly printing 10,000 copies and distributed to over 200 locations. Reproduction in whole or in part in any manner without the written permission of the publisher is strictly prohibited. discover the art of joyful living! We Buy Books! Hardcover books In Good Condition. Call For More Information. Film Screenings@ University of South Carolina, Beaufort, • • • SCHEDULE OF EVENTS • •Arts,• Center for the 805 Carteret St. Volunteers Always Welcome All proceeds provide compassionate care for patients, families and the community. Fine Chocolates and Other Confections Made On The Premises! Less than one mile across the bridge from downtown Beaufort. required role continues to impress casting directors. She also plans to audition for The Wizard of Oz with the Beaufort Children’s Theatre for the spring. “She doesn’t care about being famous. She doesn’t want to be famous and in fact, hates it when we tell people what she does or tell her teacher why she needs to miss a day. She genuinely just wants to entertain people,” said her mom. “As long as she enjoys this roller coaster ride, we will keep going.” For Sophia, she is already doing what she wants to do when she grows up. Beaufort Town Center Join the successful businesses in Beaufort Town Center! Contact 303 Associates for Leasing Opportunities. Health & Wellness Issue Coming in March! Get the â&#x20AC;&#x153;Juiceâ&#x20AC;? of whatâ&#x20AC;&#x2122;s going on in Beaufort! â&#x20AC;˘ The only full color, quality of life community magazine in Beaufort. â&#x20AC;˘ Promotes positive business culture. â&#x20AC;˘ Ad production by professional design team included in cost. â&#x20AC;˘ Average 4-5 readers per magazine. â&#x20AC;˘ Local stories about local people, events and happenings. â&#x20AC;˘ Minimum of 4 week exposure in local market place. â&#x20AC;˘ Seasoned and creative publisher, writers, photographers and graphic designers. â&#x20AC;˘ Knowledgeable account executives that will help you formulate a plan to stay ahead of your competition and work with you to effectively market your business â&#x20AC;˘ Flexible contract options-including advertorial opportunities! collection of framed posters from most of the movies made in Beaufort, including a poster for The Prince of Tides signed by Pat Conroy, along with a few items of memorabilia from movies shot here. Mary Lou and Paul Keyserling put the exhibit together in a very short time. With assistance from Beaufort History Museum board member Stuart Heath, Mary Lou also planned a reception at the Museum for the opening of the movie exhibit, complete with popcorn, soft drinks and wine. The first-time visitor to Beaufort will be in awe of the film history of this tiny town!” This special exhibit, Beaufort in Films, is open through February 28, 2019 at Beaufort History Museum, located on the second floor of the historic Arsenal at 713 Craven Street. The exhibit features the Tuckers’ collection of movie posters, video, and memorabilia from films made in the Beaufort area, including many of those listed below: •The Great Santini (1979) •The Big Chill (1983) •The Prince of Tides (1991) •Daughters of the Dust (1991) •Forrest Gump (1994) •The Jungle Book (1994) •Chasers (1994) •Something to Talk About (1995) •White Squall (1996) •Last Dance (1996) •G.I. Jane (1997) •Gone Fishin’ (1997) •Forces of Nature (1999) •Rules of Engagement (2000) •The Legend of Bagger Vance (2000) Filmmakers will be admitted to the special Beaufort in Films exhibit and the Museum without charge when they present their Filmmaker All Event Pass at the visitors’ center in the Arsenal. Anyone who presents a BIFF event ticket during the festival will receive a $2.00 discount on admission. people may realize. The recent hit movie Halloween, the 1978 reboot released last year, was filmed in Charleston, SC. Mr. Mercedes, the ongoing TV series in its third season, is now being filmed in Charleston. The Sinner (season 1), a recent mini-series was filmed in Charleston and so was VicePrincipals. Sophie and the Rising Sun (2016) was shot in McClellanville, SC.” Collaboration: A Key to BIFF’s Success In addition to partnering with Beaufort History Museum on the current Beaufort in Films exhibit, the Tuckers collaborate with many other organizations and businesses to help make BIFF successful. “The annual Beaufort International Film Festival is made possible as a result of collaborating with a village of people in and around Beaufort who have an appreciation for the art of film making,” explains Ron. “The Beaufort Area Hospitality Association has been instrumental to our success and the support that BIFF receives from local hotels and B&Bs is a key. The restaurant owners also offer a warm welcome to the filmmakers and film lovers who come to Beaufort each February. In addition to the hospitality industry, many others step up to support BIFF through sponsorship, volunteering services,both personal and professional and by simply buying a ticket to see the films. It takes a village of supporters to present the festival as a first-tier artist event. 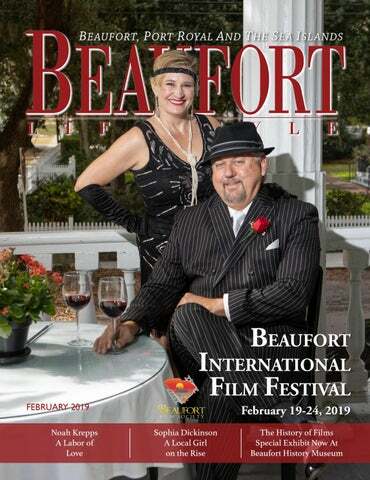 The outpouring of support for BIFF in our community is tremendous!” The Beaufort International Film Festival is making its own history and is integral to the future success of film making! he Beaufort Twilight Run, presented by Habersham Properties, will host husband and wife national champion runners Stephanie and Ben Bruce at its 11th annual event on March 22 to 23. “Stephanie is one of the fastest and most popular female distance runners in the country,” said BTR Race Director Lauren Kelly. “She has developed a huge following for her transparency on the challenges of life and motherhood,” Kelly said. “Stephanie and Ben are family oriented and have a heart for giving back to their community, making them the perfect fit for BTR.” The Bruce’s and their two sons plan to attend the BTR on race day on March 23. In addition, the community is invited to meet and hear from them at a family-friendly pasta dinner at 6:30 p.m., Friday, March 22 at Riverview Charter School. Tickets are $15 per person and can be purchased at www.BeaufortTwilightRun.com. BTR expects 2,600 participants and spectators from across 20 states at the main event on Saturday, March 23 at Beaufort’s Habersham Marketplace. Races and festivities take place from 3:30-9:30 p.m.
specialize in “Southern Fried Funk.” The BTR’s total cash purse is more than $6,100 with payouts to be awarded in the 13.1 Mile Beaufort Challenge, 10 Mile Run, 8K Run and 5K Run. Categories include the three overall male and female winners of each of those races, as well as for the top male and female Masters (40+), Active Duty Military and Hometown Hero (a Beaufort County resident). In addition to cash prizes, age group winners will receive a gift for their accomplishment. Plus, a $1,000 bonus prize will go to any male or female runner who sets a new 10-mile all comers state record. For more information and to register, please visit www. BeaufortTwilightRun.com. Early registration discounts are available for all participants, as well as additional discounts for students, groups of ten or more, and active-duty military. The BTR’s mission is to host a fun, competitive and memorable annual event for Beaufort to benefit Riverview Charter School – a free public school open to Beaufort County kindergarten through eighth-grade students. Good to Know: •Known as the “Lowcountry’s Running Festival,” the BTR offers more race options than any other event in the Lowcountry. •The BTR is one of only two events in South Carolina to offer a 10mile race. •All race courses are spectator-friendly and offer beautiful marsh views beneath canopies of live oaks. •Events will be held rain or shine. •BTR benefits Riverview Charter School. mentoring and living in Israel for a few years, Atlanta native Nic Stone returned to the U.S. to write full-time. Dear Martin, her first novel, is loosely based on a series of true events involving the shooting deaths of unarmed African American teenagers. Shaken by the various responses to these incidents and to the pro-justice movement that sprang up as a result. Stone began the project in an attempt to examine current affairs through the lens of Dr. Martin Luther King Jr.’s teachings. The nonprofit Pat Conroy Literary Center is South Carolina’s first affiliate of the American Writers Museum, second American Library Association Literary Landmark and TripAdvisor’s top-ranked attraction in Beaufort. The Conroy Center preserves and continues the literary legacy of Pat Conroy (1945–2016) as a teacher, mentor, advocate and friend to readers and writers alike. The Conroy Center is located at 905 Port Republic Street in downtown Beaufort, open to the public from noon to 4:00 p.m. Thursdays through Sundays. To learn more, please visit www. patconroyliterarycenter.org. they need to succeed on their first day of school. In 2018, Women United distributed more than 1,000 backpacks to local students throughout Beaufort and Jasper Counties. During Power of the Purse, Women United will honor the Woman of the Year finalists and announce this year’s 2019 Woman of the Year. Women United is currently accepting nominations for the 2019 Woman of the Year. Nominations are due no later than Friday, February 22, 2019. For requirements and nomination forms, visit uwlowcountry.org. ABOUT WOMEN UNITED Women United, previously named Women’s Leadership Council was founded locally in 2012. Women United members work together to engage, educate and empower others to become leaders and actively participate in the betterment of our community. Women United’s mission is to mobilize the caring power of women together to advance the common good by focusing on education in the forgotten pockets of Beaufort and Jasper Counties. eaufort Memorial Hospital presents the 10th annual Bands, Brews & BBQ, bringing two days of food, music and fun with wings, barbecue, craft beers, live music and kids’ activities on Friday and Saturday, February 22nd & 23rd. We are excited to announce that this year’s event will take place at The Port of Port Royal. This official South Carolina Barbecue Association sanctioned event kicks off the 2019 season and benefits FRIENDS of Caroline Hospice. Friday night is the Wing Throw Down from 6 p.m. to 10 p.m. where you can sample wing recipes from participating cookers while enjoying live music from Alabama folk-rock band, Winston Ramble and opening act, Nashville singer/song writer Brendan Roberts. ME FOR SOME IME MUSIC AND FUN! Auditions for THE WIZARD OF OZ, February 26 and 27, 2019 Ages 7 - 18 Feb. 26 - 5:156:30 for ages, 7-9 and 6:30 – 8:00 for ages 10 - 12. Wednesday, Feb.27 - 5:15 - 6:30 for ages 13 - 18, Call Backs 6:30 - 8 PM. From today until your day, we do! Let us help you plan your perfect day on an intimate island against the backdrop of the beautiful Atlantic Ocean. We can plan events for everyone in your bridal party including golf outings for the groomsmen or a bridesmaids luncheon aboard the Fripper. Fripp Island Golf & Beach Resort oﬀers casual elegance on the most beautiful of South Carolina’s barrier islands, just down the road from Beaufort. “A home is one of the most important assets that most people will ever buy. Warren Buffet, Chairman and CEO Berkshire Hathaway Inc.